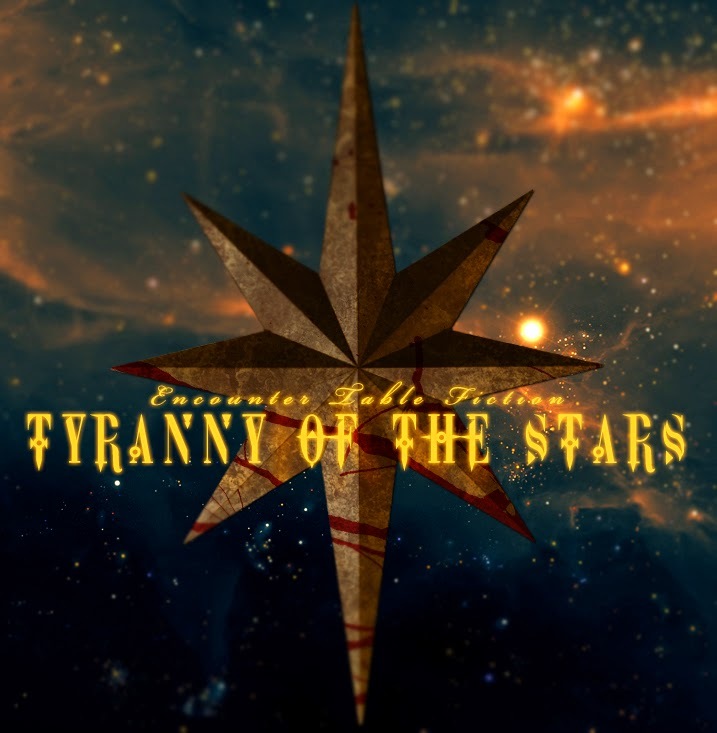 Tyranny of the Stars by Robert Brookes. July continues to be a busy month for me as new opportunities come in and old projects reach their conclusion. This, as always, results in less updates here at the Encounter Table. I've been working closely with Raging Swan Press in the development of their Demiplanes product line, so I highly recommend you keep an eye out for The Frozen Cage when it comes out in September. Additionally I'm working on a project with Amber E. Scott that I can't wait to talk about more in depth. There'll be more on that as it becomes available for discussion! This week the Encounter Table's serialized fiction, Tyranny of the Stars continues with Part VIII and delves below the city of Alkenstar on a mission to discover a fragment from Earthfall before the dreaded Anaphexia can get their hands on it. In this week's Between the Lines, at the end of the story, we delve into the fighting style of the character Patris' and give you options for how to blend combat maneuvers into other attacks. Let us know what you think about the Encounter Table's fiction in the comments section, or check us out on Facebook! A sudden impact sends boards from an old wall exploding outward in a shower of splintered wood and cracked plaster. The clatter of debris raining down is amplified by a cavernous echo of the space beyond the demolished wall. Through the now gaping hole in the wall, a silhouetted man's frame comes into view and steps through the opening, brushing plaster dust off of his shoulder. Dipping into view behind the figure, lit by the light of a sunrod, Aribessa Montclaire looks around the broken wall with an appreciative whistle. "Patris," she chirps, "if your leadership skills are as good as your remodeling skills, you might have a career as a construction foreman after this." Still shaking plaster debris off of his body, Patris scoffs and looks back to Aribessa, then beyond her to Czanis and Iosef. Raising one hand to shield his eyes from the light of the sunrod, Patris squints and grimaces. "How far's the sewer entrance from here?" "'Bout ten paces to yer' right," Iosef explains, following Aribessa and Czanis into the formerly sealed room. "There should be a hatch in the floor, that'll lead to a ladder that goes straight down t'the wet sewers." Patris' brow furrows, "Wet sewers? As opposed to—"
"Imagine a big wall," Iosef begins to explain, hauling some of the rubble up off of the floor. "But it's made of everything you ain't never wanted to touch with your bare hands. Old rusty metal, splinters a'wood, human waste, human remains." Aribessa pales slightly as she listens to Iosef's explanation, but Czanis remains unphased. "The Bile Wall," he affirms. "It's a real thing. It's like... a plug of everything that's been cast off or forgotten. It seals up the active portion of the sewers, creating a partition where the sewage doesn't flow anymore and marks the beginning of the undercity." Having revealed an old, metal hatch concealed by a rotten barrel, Iosef signals for Patris to give him a hand, and the two begin prying the stuck hatch open with a groan of protesting metal. When the hatch finally gives way and flies open, a gust of foul smelling air erupts from within, causing everyone to recoil as if they'd been struck in the face by a closed fist. "We're going down there?" Aribessa manages to gasp out the words between retching gags. "Our Chelish patron's made her point," Iosef reluctantly says. "This is the shortest path to the undercity. Girl's done her research." At that, Iosef looks back through the opening in the wall Patris made in silent contemplation, then looks back down into the hatch. "Down we go," Iosef says before swinging his legs into the hole and climbing down the metal-runged ladder. One by one the group makes their way thirty feet down the narrow brick shaft and into an active sewer tunnel. The narrow walkways on either side of the ancient brick tunnel are slick with waste and mold. The stench makes Aribessa gag again, cupping one hand over her face and reflexively turning to try and move away from the smell. Unfortunately, there's nowhere to turn that isn't just as bad. At the bottom of the shaft, Aribessa lays the sunrod down on the ground as a marker to indicate their exit, should they need to come back this way. "Mask up," Iosef instructs, pulling a handkerchief from around his neck up over his face. "Won't help the smell much, but you don't want t'get any of this splashed in your mouth on accident." Patris gapes at Iosef through a look of revulsion, wondering to himself if it were necessary that the gunslinger make that distinction. "Contact with the skin's bad enough, but anything more's downright fatal." At that, Patris unfastens his cloak and winds it around his neck and face, tucking the fabric under itself to hold snugly. Aribessa, rooting through her satchel, struggles to find something appropriate. Noticing the difficulty she's having, Father Czanis approaches and offers out a black and grey scarf embroidered with elaborate sapphire blue patterns. "Here," he says softly, "tie it tight." Wide eyed, Aribessa looks at the scarf and recognizes it for what it is as she reluctantly takes it. "You're Varisian?" Aribessa asks as she brings the scarf up to her face. Then, surprised, she interjects with, "Lavender?" Smiling, Father Czanis nods in agreement to both the literal and rhetorical question. "Scented oils, it—" he shakes his head, dismissing the explanation. "Magic protects me from this place's more offensive offerings," is a more practical explanation to give, tapping one finger on the amulet of Pharasma around his neck. Aribessa wrinkles her nose, wanting to press the issue but knowing it isn't the time. Instead, she winds Czanis' kapenia scarf around her face and ties it off at the back of her neck. "Watch yer footing down here," Iosef adds as he starts to lead the way down the tunnel once everyone seems ready to move on. "Everything's slippery down here, and there's worse stuff in that sewage than what you're imagining." "Iosef's correct," Czanis adds, "most of this water comes from the river up above and is mixed with runoff from the factories from both Smokeside and Skyside. Chemical pollutants from the gunworks mingle with magical runoff from alchemist laboratories. That, coupled with the pockets of primal magic down here, lead to very unsavory, often times fatal, side effects." Reluctantly, Patris asks over his shoulder to Czanis, "Primal magic?" Up ahead of Patris, Iosef stops in his tracks and looks back at him, brows furrowed in disbelief of how little Patris actually knows about where he is. "It's—complicated? It's bad," Aribessa hastily explains, "like, places where magic just doesn't work right. Like out on the river topside. But it won't affect you, since you're as mundane as they come!" The chipper tone Aribessa delivers that comment rubs Patris the wrong way, but for the sake of cohesion among the team he keeps it to himself. "Which way?" Patris snaps at Iosef, losing his patience with the sewers already. The old gunslinger glances back at Patris after checking to ensure his shotgun is loaded. With a click, he closes the double barreled shotgun and rests it over his shoulder. Iosef doesn't answer, so much as nonchalantly nod at one end of the tunnel before he starts walking. The team falls in line, with Iosef leading and Patris close behind. Aribessa keeps close proximity to Patris, and Father Czanis takes up the rear, anxiously looking over his shoulder back at the sewer waters and lightless branching passages. As the team gets further away from the entrance shaft and the light of the sunrod marker, Aribessa pauses to retrieve her wayfinder. Holding it up in one hand, she opens the magical compass and whispers across its face a command word. Immediately the compass face of the wayfinder begins to shed a warm, golden light. As that light blooms over the party, Czanis lays a cautious hand on Aribessa's shoulder. "Be mindful of your surroundings." Czanis' voice is hushed and uneven. "There are things down here that are drawn to light." Smiling awkwardly, Aribessa slips away from Czanis' hand and continues ahead with the others. As the four make their way down the tunnel under the wayfinder's flickering light Iosef's pace gradually slows, not out of fatigue but concern. Raising his shotgun Iosef stares down the iron sights then lowers the firearm slowly. Creeping up, Patris whispers, "What's up?" Iosef shakes his head in response, rubbing one gloved hand across his chin. "No rats," Iosef somberly points out. "These tunnels are usually swarming with 'em." Squinting, Iosef looks back past Patris to Aribessa. "You got anything that can see long distance? I got a bad feelin' about this tunnel. We might have t'circle back and take the long route up through Smokeside." Worrying her teeth at her bottom lip, Aribessa looks reluctant to say anything. After a moment's hesitation she just shakes her head. Sighing, Iosef turns back to the tunnel and grimaces uncomfortably. When Patris moves to pass by Iosef and take the lead, the old gunslinger stops him with a hand to the chest. "I ain't scared," he clarifies, "I've just seen enough not t'be overconfident." "We—" The echo of Aribessa's own voice causes her to hesitate, starting again in a quieter tone. "We don't know how far ahead of us the Anaphexia are. Circling back could lose us valuable time." Afraid of that answer, Iosef resigns himself to soldiering onward, shotgun raised at the ready and pace slowed. Patris quietly unsheathes his Aldori dueling sword, revealing the curved blade to the light of the wayfinder. From here, tension keeps conversation down and every drip, creak, and rumble through the sewers elicits hushed breaths and anxious stares from the team. For the next half hour they move through the sewers at Iosef's lead, following a circuitous path through junctions, across crumbling gaps in the stone walkway, and past drainage pipes that spill out over the Alken cliffs; rare sources of fresh air and natural light. While the absence of the rats continues to play at Iosef's nerves, the others seem to disregard the old man's concerns as paranoia and lull themselves into a sense of security and confidence from the progress made. Eventually, Iosef comes to a stop by an arched stone entrance to an ancient cistern. Taking one knee, he waves Patris over who can already see the sour look on the gunslinger's face as he crouches beside him. "What's—" Patris begins, but Iosef holds up a hand, urging the younger man to be quiet. Then, gesturing inside of the cistern entrance, Iosef makes a gesture with four fingers. Patris' brows furrow at the inscrutable hand sign, but the sudden slosh of water from the chamber causes the hairs on the back of his neck to rise and his grip on his sword to tighten. Iosef motions down to the walkway, where tracks in the sludge resembling bare footprints move up from the sewage flow and into the cistern. Carefully, the pair move back away from the door and Iosef offers an explanation in hushed tones. "Something's in there. I'm hearing 'bout four creatures, maybe more." "I'm not comfortable with the fact that you said something," Patris remarks, looking over his shoulder to the cistern door. "What walks barefoot down here and doesn't die of disease?" Czanis is quick to answer with "the undead." Aribessa exhales a breath she'd been holding for too long at that explanation. "You got any useful magic from your Goddess, Father?" Iosef looks across the group to Czanis, who—nervously wringing his hands around his holy symbol, simply shakes his head. "I'm—not that kind of priest," Czanis is careful to answer. "You're sure it's not just the—what was it—mutants?" Patris asks, hoping for there to be some other possibility. Czanis shakes his head, looking down at the walkway for lack of anywhere else he'd rather focus his attention. "No. They don't come past the Bile Wall," Czanis explains wearily, "and—and they'd never expose themselves to this environment like that." As Patris and Czanis assess the situation, Iosef quietly requests Aribessa's wayfinder, turning it over in his hand and examining the brightness. "We ain't got any choice but t'go in," Iosef finally decides. "That cistern leads to the wall, it's the only way in or out. I'll make a pass by the door, throw in the wayfinder," he hefts the metallic case in his hand on explaining that. "Patris you be ready t'split anything that gurgles and lurches our way with that fine cleaver a'yours. Czanis... do whatever it is your kind of priests do. Aribessa..." Iosef looks the young woman up and down. "Conserve whatever resources you've got unless this goes wholly pear-shaped." "Pear sh—" Patris begins to ask before Iosef cuts him off. "It's an idiom, son. Roll with it." "We should just draw them out into the tunnel," Patris sidesteps the entire remainder of that conversation. "Bottleneck them in the doorway, right? Iosef and I should be enough to hold the line." Nodding in agreement, Aribessa seems far more comfortable with that plan and soon enough the rest are in agreement. As they move back towards the cistern entrance, Iosef clutches the wayfinder in one hand and his shotgun in the other. Patris, right behind him, angles his dueling sword down towards the ground and draws in a focusing breath of fouled sewer air. Having moved behind Czanis, Aribessa watches the forefront of the group with a nervous tension. But a sound behind the group, distant and faint, elicits her full attention—the rustle of feathers. Exhaling a sharp breath, Aribessa hears—feels—something the other's can't: a warning. "No!" She suddenly screams, grabbing a hold of Czanis' robes and dragging him back, away from the water's edge, against the greasy sewer wall. The moment she does, the sewage erupts as a gray-black humanoid form leaps from below. In its frantic movement, all anyone can make out is the mottled and bloated quality of its flesh and the dazzling brightness of a mass of blue tendrils lashing around at the end of its hands where fingers should be. Iosef turns around sharply, dropping the wayfinder at his feet and leveling the shotgun up at the creature. "Fext!" he screams before pulling the trigger and unleashing a deafening roar. The muzzle flash from the shotgun lights up the entire tunnel and the horrific creature flies backwards, splashing back down into the sewage. Ears ringing from proximity to the firearm discharge, Patris can't hear the sounds of movement behind him. Czanis has just enough time to shove Patris out of the way before another one of the horrifying fext comes charging in from the cistern. "I deny you!" Czanis cries, holding out his talisman of Pharasma as a sphere of brilliant light erupts from its surface. As the vibrant positive energy strikes the fext, they stop in their tracks and let out a whining scream. Smoke issues from the fexts' bodies and layers of their twisted flesh burn away in glowing embers and sooty ashes. But they survive. When the fext bears down on Czanis in reprisal, Patris slides in between them and draws his sword up across the creature's midsection. While his blade bites into its leathery and knotted flesh, Patris can feel the fext's skin resist the sword's cutting edge the way sturdy armor does. Throwing his shoulder into the strike, Patris slams himself into the fext and pushes it back through the cistern doorway. There, Patris can see more luminous blue tendrils lashing around in the dark as more fext come into view. "Move! Move! If we stay here we're—" Iosef's words are cut off as the fext he'd shot—missing half of its head, jaw dangling on shredded tendons and leathery flesh—leaps back out of the water and wraps its arms around the gunslinger, dragging him down into the filthy mire. Patris wheels about, eyes wide in horror as he watches Iosef sink out of sight into the sludge. As he prepares to dive in after him, Czanis grabs him by the shoulder to stop him from going into the disease-filled mess. The sudden explosion of gunfire underwater sends the fext floating to the surface with an enormous hole in the middle of its chest. Iosef splashes to the surface with a scream and a gasp for breath a moment later. Soaked from head to toe in the poisonous sewage, Iosef scrambles onto the side of the tunnel, arms shaking and eyes bloodshot. Gasping, gagging, and eyes watering he barely manages to make it fully out of the sludge before collapsing onto his side in convulsions. "Avracadas avulte!" Aribessa's incantation rings out in the tunnel as three bolts of crackling violet force weave around Patris. They streak like eels through the air, striking a fext emerging from the cistern. Each blow knocks the fext back a few paces, but does not stop it entirely. Patris charges back into the cistern, sliding across the stone walkway before swinging his sword in a broad arc with all his might. The dueling sword connects with a fext's jaw, ripping it from its face and sending the creature crumpling to the ground with a wet slap. "We have to retreat!" Patris calls back to the others, seeing three more fext in the cistern rising up from the water. "No!" Czanis calls back, rushing to Iosef's side. "He won't make it if we turn back!" Standing his ground in the doorway of the cistern, Patris adopts a defensive stance with his dueling sword as he watches the fext closing in. "We're all going to die if we don't get out of here!" "Aribessa!" Czanis looks up from Iosef with wide eyes. "Do you have anything to disable the fext? If we can get through the Bile Wall I know someone who can help us." Moving to stand beside Czanis, Aribessa offers a reluctant nod, her breath hastening and hands trembling. She watches as two of the fext move in to engage Patris, lashing out at him with the bio-luminescent tendrils that extend from their twisted and broken hands. The Aldori swordsman blocks one's advances with a swift strike of his blade, then ducks under the other and uses a shoulder slam to repel its advance. Taking one of Iosef's hands in his, Czanis' eyes briefly flick to his shotgun nearby, then to the metal cartridges of ammunition on Iosef's belt. Patris barely notices Aribessa squeeze her slight frame in around his side. She's already moving her hands in unusual patterns as she interposes herself between Patris and the fext. "Galarvantum optis fiora!" Aribessa bellows, throwing her hands out in front of herself to conjure a shimmering cloud of glittering particles that explode into the air like a ruptured spore pod. The fext caught in the burst let loose with howling screams, drawing their tendril-laden hands up to their faces. The dust coats the fext as thoroughly as it blinds them, shimmering brightly like metal fibers on their pallid skin. "Now!" Aribessa shouts, charging ahead of Patris as fast as she can toward the back of the cistern. When Patris looks back to check on Czanis, the old priest has one of Iosef's arms around over his shoulders and is hauling the gunslinger to his feet. Patris turns about, stepping down into the cistern with a swift cut through one of the blinded fext, cutting an arm clear off of its body to splash down into the sewage, tendrils still writhing. Clearing the way for Czanis, Patris watches the fext fumble about blindly, lashing out at thin air. The sudden flutter of wings over Patris' head causes him to reflexively duck, but the sight of a tiny bird elicits a moment of confusion instead of wariness. It flits out of sight, following Aribessa deeper into the cistern between tall stone columns. When Aribessa reaches the edge of the wayfinder's light, Patris kicks it across the floor towards her. The wayfinder skids, skips, then bounces, and rolls all the way across the cistern until it comes to an abrupt stop at a heaping pile of debris. The tangled mass of metal, stone, wood, bones, and twisting lengths of mouldering fabric stretches up to nearly the ceiling, bristling with sharp edges. When Aribessa comes to a stop, another fext—one not affected by her glitterdust spell—steps out from behind one of the cistern's stone columns. Gurgling and hissing, the creature lurches towards her through the deep water and she can see its muscles tensing, preparing to lunge. "Move!" Comes Czanis' voice ringing through the cistern and Aribessa throws herself out of the way before the roar of Iosef's shotgun fills the air. That fext is thrown back against the debris barrier of the Bile Wall and Father Czanis, having passed Iosef off to Patris, approaches closer while wielding the gunslinger's shotgun. Another shot roars through the cistern, and Czanis sends the fext staggering back again as he continues to walk forward. With both barrels empty, the priest of Pharasma braces himself, looking back to the blinded fext shambling closer. Patris trudges past with Iosef's limp body draped over his shoulder, sword held out awkwardly in one hand. "We have to go over that?" Patris asks in disbelief. A gurgling roar erupts from one of the fext as it clears its vision, hustling through the water with renewed purpose. Handing off Iosef to Czanis, Patris barks, "Get back to the wall!" Steadying himself for the fext's rush, Patris is startled to see a quick glimmer of light whip past his head as a spear strikes the approaching fext square in the chest. The fext's flesh bubbles and sizzles at the impact, smoke issuing up from the wound. Disbelief flits across Patris' face, and the Aldori swordsman steps in to finish off the fext with a vicious slash through its face that nearly splits its head in twain. But as the fext's body splashes down into the murky sewage, two more come slogging closer through the water. Halfway up the debris wall, Aribessa stops dead in her tracks when she spots the shadow of a humanoid figure hunched atop the debris. Something in the figure's hand glimmers in the wayfinder's light—a spear with a reflective head—and the concealed figure hurls it down from the wall. This spear strikes an approaching fext in the head, causing its eyes to boil and rupture and its flesh to melt from dissolving bone. Gasping in disbelief, Aribessa continues her ascent, climbing all the way to the top with cuts and scrapes left across her body from the jagged surface. There, at the top of the wall, a squat humanoid with mottled flesh mixed with lizard scales, tufts of fur and mismatched eyes glowers at the young woman. It retrieves another glass-headed spear from a collection of them on the opposite side of the wall, and hurls it down. "Come!" The creature rasps in heavily-accented Taldan. Czanis needs no further urging as he gets to the wall and begins his climb. Czanis, unlike Aribessa, seems unsurprised by this creature's appearance, or the eventual arrival of more of its motley kind. From over the wall three more hideously misshapen humanoids with blended human and animal bodyparts emerge. Each of them takes up a glass-headed spear, raining them down across the cistern at the remaining fext. Patris, the last to reach the wall, hands Iosef off to Czanis and one of the beast-man mutants work together to lift him up the debris pile. Outmatched, the last of the fext withdraw from the tunnel with howls and screams, disappearing back into the poisonous sewage they'd emerged from. The sewer falls quiet, save for Iosef's irregular gurgling breaths and the distant trickle of water. You sacrifice accuracy in combat to perform additional combat maneuvers. Benefit: When taking a full-attack and fighting with a one-handed or light weapon and your other hand free, you may take a -2 penalty on all attack rolls made that round to perform one combat maneuver as a free action at the end of your attacks. This combat maneuver uses your full base attack bonus, plus any modifiers appropriate to the situation..
You are adept at mixing attacks and combat maneuvers. Benefit: In addition to the combat maneuver you may make as a free action when using Maneuver Combination, you may make a second additional combat maneuver, albeit at a –5 penalty to the combat maneuver check. You are a master at mixing combat maneuvers in with weapon strikes. Benefit: You may make a third combat maneuver when using Maneuver Combination, at a –10 penalty to the combat maneuver check.